For the third straight week, the box office will be dominated by The Passion of the Christ, which has in short order guaranteed itself a place as one of the highest grossing films of 2004, with sunny skies for the foreseeable future. The new films this week present a pretty weak challenge, unlike last week's duo, which made a stab at blockbuster status. At $228 million (as of Wednesday), The Passion is already the highest-grossing film released in the first three months of a calendar year. It should easily make that the first four after this weekend, passing My Big Fat Greek Wedding at $241 million. Thoughts of a Titanic-like phenomenon were mostly passed over after a falloff of 36.5% from weekend number one to number two. Notably, the figures followed a very typical pattern with Friday being down more and Saturday down the least, with a possible Sunday peak not materializing as of yet. However, this is a great figure for a film that opened so high, something not really seen since Spider-Man, which went on to earn about 3.5 times its opening weekend. Extrapolating that figure here would give a final total of around $335 million (including the previews), which seems reasonable enough for now (and how bizarre is that?). However, an Easter rebound for the film is very likely, making this kind of extrapolation quite difficult. As far as this weekend goes, the "curiosity factor" is still running strong and should keep the film on the same course, if not even a little better, drop-off wise, at about $36 million. Johnny Depp, he of the deliberately strange script choices and ego-defying roles, finds himself in the unusual place of being a box office draw after the massive success last summer of Pirates of the Caribbean. He's never been more popular and probably has never cared less. This makes Secret Window an interesting test case. Another step in the quest to adapt every single thing Stephen King has ever written to the screen (though interestingly, avoiding putting his name in connection with the film), Secret Window is about a successful yet mental blocked writer who finds himself confronted by a strange figure about the story that first launched his career. John Turturro plays this man, who proceeds to hassle Depp for revenge. 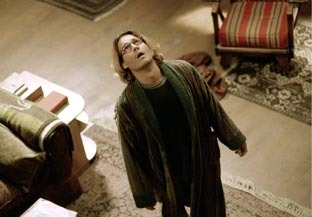 Ably handled by writer/director David Koepp, who knows a thing or two about psychological thrillers, Secret Window has the potential to makes some noise at the box office but also has the potential to piss off a lot of Depp's new-found fans. While not exactly unlikable, his writer character is a bit of a mope. As well, the film has plot developments that are likely to turn people against it, though it'll undoubtedly capture some votes for "genius." This lines up well with something like his From Hell, which opened in 2001 to about $11 million. Post-Pirates, Depp should be able to do better than that here, and I expect around $17 million for the opening weekend. Whether word-of-mouth will carry this or sink it will be very interesting to see. Rushing to theaters so fast you can practically see the skid marks, Agent Cody Banks 2: Destination London is a rather obvious attempt to squeeze the last ounce of "cute" out of Frankie Muniz before he his that awkward stage (though at 19, he's hardly the worst offender in the "youngening" category). A sequel to the moderate hit last year, it's also a pretty transparent attempt to hone in on the Spy Kids phenomenon, which has proved elusive as of late. The first edition of this film at least had the benefit of looking novel and sincere; but then again, its target audience isn't really looking for sincere. Adding the mind-bogglingly unfunny Anthony Anderson to the cast probably doesn't help either. Agent Cody Banks opened to about $14 million last year; this one looks like a step down. Give $10 million for three days. David Mamet's films are respected almost immediately by a portion of 'in-the-know' cineastes; his rapid-fire dialogue, for both comedies and thrillers, is a trademark that has made him a legend. He's yet to ever have that box office breakthrough, though, and it doesn't look as though Spartan will fill that bill for him, opening as it is on just over 800 screens. Starring Val Kilmer as a special government agent investigating the kidnapping of the President's daughter, it's bound to be like his other films; breaknecked and heavy on plot twists while dense with literate dialogue that will chase many viewers away. His last film, Heist, opened to about $8 million on over twice the number of screens as this, and that was with a better known cast (Gene Hackman, Danny DeVito, Sam Rockwell, etc.). Mamet makes seriously fun films, but they're not for everyone. Spartan will live up to its title with a modest $5 million take. Ben Stiller seems pretty invincible as of late, with two straight $25 million plus openings of marginal-looking films. Mind you, Owen Wilson deserves credit also for this latest effort, Starsky & Hutch, but it's Stiller that's on the hot streak. The '70s throwback cop comedy has probably revitalized the TV adaptation again and for that, we should all feel very remorseful. It's doubtful that S&H is going to be considered a classic of any kind, but the number of haters for it also probably pretty small. That said, it's probably not long for this world in the multiplexes, as these kind of films die out pretty fast after a big opening. It should manage to stay around the $16 million mark. Hidalgo had a promising start at just under $19 million last weekend, but also doesn't seem likely to have long legs; it only split the difference with critics and has completely unremarkable word-of-mouth. Kudos to Viggo Mortensen for showing some post-Rings star power, but he'll have to pick better films to maintain his star status. Look for between $10-11 million for this frame. Speaking of Rings, The Lord of the Rings: The Return of the King bounced back into the top ten after its Best Picture win to the tune of $3 million. It's sitting solidly in sixth place all time, but has virtually no hope of moving further, as it's a good $35 million or so behind Spider-Man, a pretty insurmountable lead at this point. The staying power of this third film in the Rings series cannot be denied, as the last entry in a trilogy is not often its highest grossing, even one of such high stature as this one. Monster also ducked back into the top ten briefly, and the $30 million it's made may be almost as impressive given the dismal subject matter of the film. All of the Oscar winning films should see a slow ride out to pasture from this point on.